? Fast and Energy Efficient: All three Micro USB Chargers provide customers with a faster charge time – charging phones at least 20% faster and up to 50% faster than standard chargers (depending on the phone). The chargers also feature a high-efficiency LED, which activates when the charger is plugged into a power source, reminding customers that the charger is still in use – providing a visual prompt to unplug chargers when not in use. 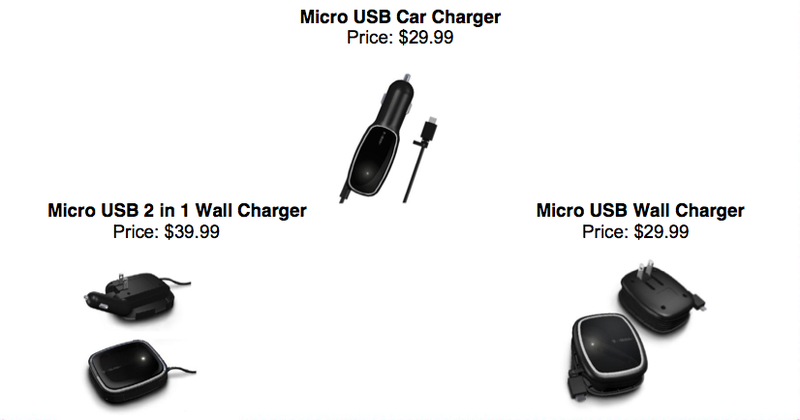 The Micro USB Wall Charger and Micro USB 2 in 1 charger have a Level 5 Energy Star rating – the highest rating for consumer electronics.
? Convenient: The Micro USB Chargers feature an extra USB port, allowing customers to charge other electronic devices using the same charger, such as an MP3 player, Bluetooth headset or digital camera. Having one charger compatible with many electronic devices eliminates the need for additional cords and equipment when traveling.
? Neat and Tidy: The Micro USB Chargers provide users with a neat and tidy cord management solution. All Micro USB Chargers have a channel that allows the cord to be wound around and contained with a small clip while not in use. In addition to keeping things neat, the design helps preserve the life of the charger, by reducing the stress on the charger cord. Sounds good right? Nobody will complain about carrying around one less charger that works faster and organizes better. Good job Tmo. its not retractable….its just wound around…..retractable would’ve been even better….i still don’t see whats so different about these unless theyre having every phone come out with a micro usb port. Thats more than likely their plan… haven’t you read the story on how t-mobile wants to eliminate the confusion and shiit by having them universal. I actually have to disagree about retractable cords being better. I have had many devices with retractable cables and what-not only to have the retracting mechanism fail quite quickly. This manual-wind has no moving parts to break and therefore will last much longer. Nice to put an extra USB port on there for charging 2 devices at once… I like that! $30 and $40? Really? You can get cheap crappy ones on ebay for $4 delivered. Yeah, its a bit much. Although, I’ve owned one of those cheap car chargers and it failed on me… the connector became loose and would disconnect intermittently, killing my phone’s battery in the process. I’m not trusting another cheap charger anymore but I think T-Mo can do better than gouge us on these. I’d be more willing to pay $20-$30 considering the very welcome extra port on the charger. Wow gee thanks TMO. Notice how this stuu ff gets cheaper in quality yet more expensive? That’s great but I sick of having a good phone but poor 3g. I’m using the Nexus one and my bud has the HTC incredible. We both are working in the same building he showing killer 3g and I’m on edge. Then some Iphone user walk in and he’s on 3g. T-Mobile need to get on the ball here. I’ve been loyal for 8 years and I’m losing faith. When 3g is good it’s real good but when it’s weak it’s really BAD. Will this work with the N900? Actually saw these critters at my local T-Mobile corporate store. Bad news, bunkies: These have the same mAH ratings as your standard HTC chargers (1000 mAH)-so the claim of being ‘faster’ are very suspect. Now, whether or not they are like the super-green Nokia charger for the N900 (which kicks out 1200 mAH) is anybody’s guess. Or, with the $37 I save by buying one on eBay, I could buy ~370 kWh of electricity…enough to leave the cheaper charger plugged in in “vampire mode” for 8.41 years – not to mention I don’t have to sit there watching the LED like a hawk and worry about plugging something in and out again in the middle of the night! (math: 370 kWh/5 watt draw idle draw, a VERY generous estimate = 74,000 hours/24 hours in a day = 3083.3 days/365.25 = 8.4117 years). picked one of these up yesterday the 2 in 1 one and this thing is sweet. i can charge two phones or my phone and my iphone or my blue tooth up at the same time in the car!! !